And so after looking at several “alien abduction” cases it seems that the abilities of Fallen angels to cause False Visions (and all that entails) and terrifying dreams, as well as elements of Physical manifestation, are sufficient to explain what abductees experience. Next we are going to move on to looking at the Physics and Science of this being the case, and how science does not conflict with the existence of fallen angels, or them having these abilities. 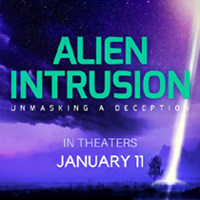 Some people think that the most straightforward explanation for these alien abductions is flesh-and-blood extraterrestrials with advanced technology, even perhaps having time-travel capabilities, and perhaps with military involvement. And to some people, the explanation of fallen angels with vast supernatural powers who can cause powerful deceptions seems too spiritual of an answer. But the understanding of Modern science and it’s theories actually allows both for the existence of such creatures as fallen angels, and for them to have inherit supernatural powers such as these. The explanation of fallen angels is not any less science-friendly than biological extraterrestrials with advanced technology, and actually in some ways the explanation of fallen angels is more science-friendly, contradicting modern known science far less than the biological ET with advanced technology explanation. Some people think the miraculous is impossible, and use science as a justification for this claim. The miraculous could be miracles from God, or worked through Holy angels. Or the miraculous can come in the form of false signs, miracles and wonders from fallen angels, such as what they do in causing False Visions, dreams, and physical manifestations. The goal of the following is to show the miraculous abilities of God, Holy and fallen angels are allowed by science, using modern physics terminology and theories. This is towards being about to explain how they might do such things, from a modern physics perspective. The main point of doing this is to show that modern science does not preclude the existence of the miraculous. I believe modern science actually completely allows for either God or angels of either kind to work miracles without violating the laws of science, and for the existence of angels and their Biblically described abilities. The science involved is all just theoretical, mainly secular theories, and I do not claim any of it is correct, though much of it is accepted as such by some people. All of the categories of angelic Visions would be called supernatural events. 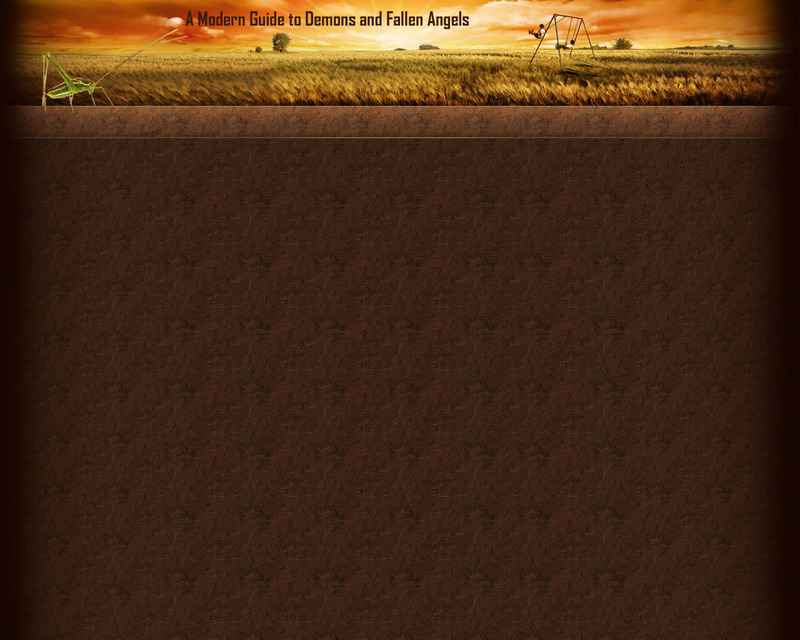 There are some words in the Bible to describe the “supernatural” activities of God, Holy angels, and fallen angels. From the Bible it is clear that God in His three persons, Holy angels, and also Fallen angels, are all capable of performing signs, wonders, and miracles. How, in physics terminology, might God work signs, wonders, and miracles? According to modern science, we live in an observably 4 dimensional universe. The universe is made of space(3) + and time(1) dimensions, which equal the Spacetime we can see. God made all the 3 dimensions of space that we see (length, width, and height), when God “created the heavens and the earth”. 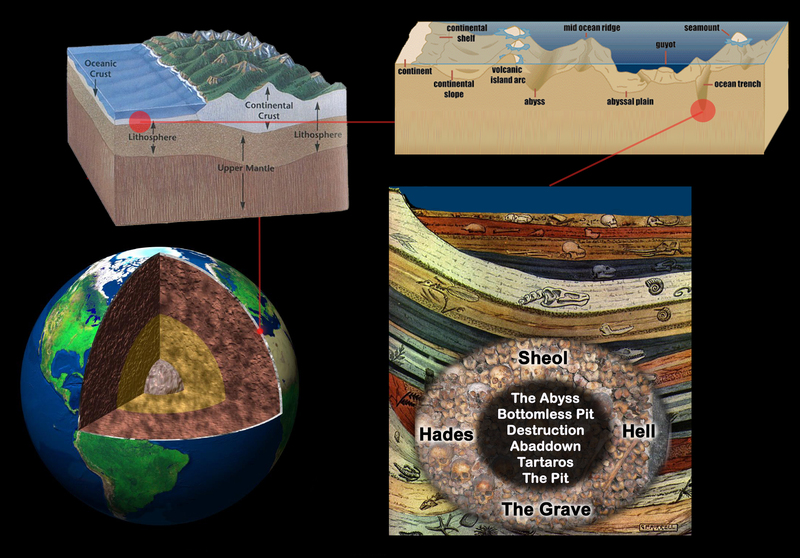 (Eph 3:18 also references to the “depth” which compares more the size or extent or full scope of something.) God made the dimension of time “in the beginning”, which marked the creation of time itself, the dimension of time as we know it. God is eternal, and having made time itself, God is outside of time, and was here before time was created. God has complete authority and control over the dimension of time. God also made the three dimensions of space that we can see, and is also outside of them. So, God made it all, and is outside of the entire universe, having created it. The “parallel universe” concept in science fiction actually is very different from the use of the term “dimension” in science, as you can see above. In theory, a “parallel universe” would also have 3 spatial dimensions (length, width, height) and a time dimension. That means a “parallel universe” in theory actually has 4 dimensions of its own. Additionally the assumption is that there is a 5thdimension to our universe which would be used to allow travel to the parallel world, which has its own 4 dimensions. It would not be accurate to say a “parallel universe” uses the same 4 dimensions that our universe has, because by definition a “universe” is everything that is. So a “parallel universe” would have to have its own construct of dimensions which define its reality and cosmological structure, and not just borrow use of the dimensions inherit in our own universe. This is of course all fictional theories that come from science fiction, which has nothing to do with actual science. And I want to clarify this, as any statement that science has straight theories on “other dimensions” does NOT have anything to do with the science fiction concept of “parallel universes”. If science were to find some evidence of observation of a “5th dimension” inherent in our universe, this has nothing to do with a “parallel universe”. The term “dimension” is a science term first, and has been misleadingly borrowed by science fiction in such a way that its meaning is construed. The Bible teaches that “in the beginning” God made the “heavens and the earth”, and that at the end of the 6th day God “ saw every thing that He had made, and, behold, [it was] very good…Thus the heavens and the earth were finished, and all the host of them.” Gen 1:31,2:1. This means that in making the heavens and the earth, and the host of them, God made everything that He made. There isn’t anything else besides what God made, and there is no mention made of any other universe besides the entirety of the universe we know which God made. So there actually are no “parallel universes” and the concept itself contradicts the Bible, as this universe is all God is said to have made, and is well-defined by the Bible. God made the heavens and the earth, and these terms are well-defined, and there is nothing more that God made besides the heavens and the Earth, and the host of them. We know what the Earth is, but beyond this there are multiple heaven(s) that God made, and the Bible defines each of them for us. And so the Earth, the atmosphere (first heaven), outer-space (second heaven), and where God’s throne and the angels in heaven dwell (third heaven) is all the areas that exist in all of God’s creation. 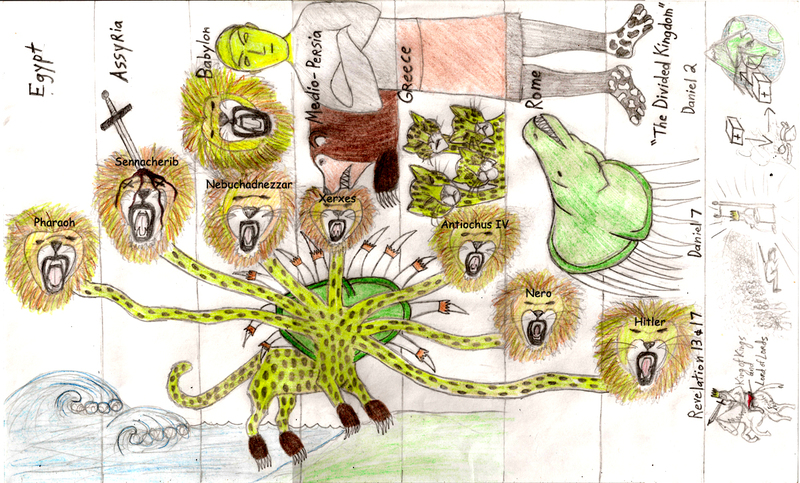 None of these are a “parallel universe”, and so the Bible does not describe any “parallel universes” to exist. Rather, the Bible’s thorough defining of the entirety of creation actually precludes the existence of anything along the lines of the concept of a “parallel universe”. All that being said, using the term “dimensions” in a science context, (spatial length, width, height, and time) are there more dimensions that God made, besides the 4 we can perceive, and see with the naked eye? It seems possible that there are more dimensions than we can perceive, because the Bible teaches there is an invisible spiritual realm. The Earth has 4 dimensions that we can see, but also the Bible teaches that there is an invisible spiritual realm all around us on Earth, and in this spiritual realm, spirits have a presence, like Holy angels, fallen angels, and demons. We know that demons, when they are cast out, travel through desert places, yet we cannot see them. (Matt 12:43, Luke 11:24) We know that an army can exist on this Earth invisibly, right in front of us, while remaining unseen. This happened in the case of Elisha and his friend, And Elisha prayed, and said, LORD, I pray thee, open his eyes, that he may see. And the LORD opened the eyes of the young man; and he saw: and, behold, the mountain [was] full of horses and chariots of fire round about Elisha.” (2 Kin 6:17) When God opened his eyes to the spiritual realm, he saw an army all around them fighting for them. This is the spiritual realm that exists all around us, but is invisible. The same sort of army, God’s army which is the “host of heaven” or the angels of God, is mentioned in Josh 5-6 in the battle of Jericho. “And he said, Nay; but [as] captain of the host of the LORD am I now come. And Joshua fell on his face to the earth, and did worship, and said unto him, What saith my lord unto his servant?” (Josh 5:14) The “host” of the Lord is His army, which are the angels. While the walls of Jericho seemed to fall miraculously, the Bible does indicate that the army of God’s angels was present. It is entirely likely that God’s angels had a hand in the actual mechanics of the wall of Jericho coming down. And so we know there is an invisible spiritual realm here on Earth. In the first heaven, the atmosphere, the Bible also indicates that besides the physical part of the atmosphere, of air and clouds, that the invisible spiritual realm is there also. Angels fly in the atmosphere, which is the first heaven, so the invisible spiritual realm must be there too. (Eze 8:3, John 1:32, Rev 8:13) And Satan is called the “prince of the power of the air” by the Bible, and “air” refers to the atmosphere (Eph 2:2). The third heaven seems to be entirely made of an invisible spiritual realm, as when we look into the farthest reaches of space, we cannot see God’s throne or the angels. As obvious as that is, it shows us that precisely wherever God’s throne and the angels of heaven are, they are in an invisible spiritual realm. And this makes sense that the third heaven is a spiritual realm, as the third heaven is where God is, and God is spirit. In between is the second heaven, which is defined by the Bible as outer-space. The Bible clearly indicates that the second heaven also contains the invisible spiritual realm, and that angels pass through it as they descend to Earth, and ascend back to the third heaven. Gen 28:12-13 makes clear that the second heaven, which is outer-space, must also contain the invisible spiritual realm, as we do not see the angels as they ascend and descend through the second heaven. The ladder which Jacob saw indicates God has given the angels a method by which to ascend and descend. That Jacob could see Lord above the ladder indicates that the distance was not very far that the angels had to travel. So the Bible seems to teach that the angels do not actually have to transverse the vast distances of outer-space in order to reach the earth, as is seen in the physical dimensions. Rather, in the invisible spiritual realm, the distance is short enough between heaven and earth, no longer than a ladder you can see the top of. A sort of permanent ladder has been created by God for angels to travel through the 2nd heaven, going between the 1st and 3rd heavens. And so angels can be dispatched to Earth quickly, as the invisible spiritual realm is not limited by the way time is bounded in physics by the physical dimensions. How this actually works is somewhat vague, but we can get the general idea from what the Bible does say. In any case, the invisible spiritual realm also seems to exist throughout the second heaven, which is outer-space. And it should be noted that the terms here for “rulers, authorities” all refer to fallen angels. 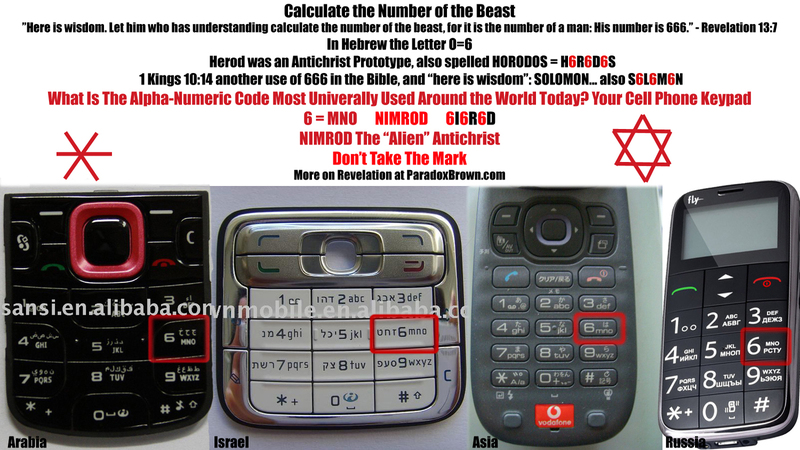 This can be seen by comparing this with Eph 6:12, “For we wrestle not against flesh and blood, but against principalities, against powers, against the rulers of the darkness of this world, against spiritual wickedness in high [places].” And so these powers and authorities are the invisible fallen angels. This could be taken, that truly angels are not physical life of the 3 physical dimensions we live in, as we are. Rather, angels are spirits of the spiritual realm, and their “bodies” exist in the spiritual realm. It would make sense that their bodies are composed of the substance of this invisible spiritual realm they live in, as human bodies are composed of the stuff of the 3 physical dimensions we live in. 1 Cor 15:40, 44 [There are] also celestial bodies, and bodies terrestrial: but the glory of the celestial [is] one, and the [glory] of the terrestrial [is] another… It is sown a natural body; it is raised a spiritual body. There is a natural body, and there is a spiritual body. The Bible acknowledges that there can be bodies made of spirit, or spiritual bodies. As our human terrestrial bodies are composed of 4-dimensional physical matter, it would make sense that living spirit or heavenly bodies would be composed of the equivalent of the “matter” of the invisible spiritual realm. Angels have such spiritual bodies, and were created with such. It would make sense that there is at least a 5th dimension, if not more, and that the angels’ bodies are composed of the analogy to our “4d matter” which is in that spiritual realm. The spiritual realm might be composed of several dimensions, in the scientific sense of the term, such as a spiritual realm width, length, and height. But even if the spiritual realm is just 1 extra dimension, in the scientific sense of the term, the invisible spiritual realm would still be a 5th dimension, 1 more dimension that the 4 dimensional physical world which we routinely perceive. All of this leads to the point that this invisible spiritual realm may be composed of more dimensions, as per the scientific use of the term. The additional dimension(s) of the invisible spiritual realm, would be an extra dimension that is at least one more than the 4 dimensions that we perceive. Thus it would be fair to call angels “extra-dimensional”, meaning of more dimensions than us, esp. if the invisible spiritual realm correlates to extra dimensions, per the science use of the term. Now, the Earth is made by God, and it has visible dimensions that science has studied many things in, and the same for the first and second heaven. We also know there is an invisible spiritual realm throughout God’s creation. Science has said much on the visible physical realm. But the fact that the spiritual realm is invisible does not mean that science will never have anything to say about it, or that no rules or bounds may operate upon the angels who live there. In fact, it seems that there are rules and bounds, like laws of physics, which are inherit in the spiritual realm as well. Even the battle in Rev 12 between the Holy angels and the fallen angels indicates that there are opposing forces best described as some spiritual realm physics being present. This is implied even in that the Holy angels prevailed, and pushed the fallen angels out of heaven, casting them down to earth. You can’t have one angel pushing another without some concept of physics being implied, even in the spiritual realm. As such, there is some chance that the invisible spiritual realm does have physics rules under which it operates, and if so, that where the invisible spiritual realm touches the visible physical realm that we know, science might be able to glean some insight, or give some insight. This possibility is especially interesting in light of more and more of modern physics studying things which are invisible, and theories on what invisible dimensions may exist behind the scenes in the universe. So if we were to guess that the invisible spiritual realm, and the creatures who are there, do have something to do with an extra dimension or dimensions (in the scientific use of the term), and spirits are therefore extra-dimensional beings, what would modern physics have to say about this? Modern physics actually does include the topic of extra dimensions, and talk from scientists about extra dimensions has to do with something called “string theory” or “superstring theory”. Some branches in modern physics are well established through experiments, such as gravity, relativity, quantum mechanics, much of particle physics, electromagnetism, and the weak and strong nuclear forces. String theory is not established, but rather is an attempt to bring all these branches of the tree of physics together, to connect them, to draw and see the trunk that all the branches stem from. String theory is highly theoretical, unproven, likely improvable and unverifiable, highly mathematical, and requires 10-11 dimensions to theoretically be able to describe the trunk of the tree of modern physics. Lisa Randall is saying, according to modern physics, that there may be very large, even infinitely large, invisible dimensions that do exist, although we can only perceive the 4 dimensions of space-time. A 5th large dimension such as this could be the invisible spiritual realm taught in the Bible, which contains angels in their spirit bodies of that dimension. While giving credence to Randall’s statement, basically Hawking says that very large extra-dimensions are possible, and would not violate the known laws of physics. In fact, their existence might help explain some rather large befuddling questions in science that are still unanswered, such as missing mass. As such, science allows for the existence of an invisible spiritual realm, potentially one in which angels are, and the spirit bodies of angels could be composed of the stuff of this extra dimension, this invisible realm. In quantum physics, the Heisenberg uncertainty principle states that certain pairs of physical properties, like position and momentum, cannot both be known to arbitrary precision. That is, the more precisely one property is known, the less precisely the other can be known. It is impossible to measure simultaneously both position and velocity of a microscopic particle with any degree of accuracy or certainty. This is not a statement about the limitations of a researcher’s ability to measure particular quantities of a system, but rather about the nature of the system itself and hence it expresses a property of the universe. This basically means that on a subatomic level, that of electrons, quarks, photons, etc., there seems to be a fundamental principal of randomness. Particles go where they seem to want to go. Particles almost seem to choose what they are doing. However, these choices do form an overall pattern, of statistically calculable probabilities. One of the most well-known and respectable scientists in recent history, instrumental in the development of quantum mechanics, was Richard Feynman PhD. He worked on the Manhattan project developing the atomic bomb, was a recipient of the Nobel Prize in Physics, and is also known for demonstrating the O-ring defects resulting in the space shuttle Challenger tragedy. One might still like to ask: “How does it work? What is the machinery behind the law?” No one has found any machinery behind the law. No one can “explain” any more than we have just “explained.” No one will give you any deeper representation of the situation. We have no ideas about a more basic mechanism from which these results can be deduced. We would like to emphasize a very important difference between classical and quantum mechanics. We have been talking about the probability that an electron will arrive in a given circumstance. We have implied that in our experimental arrangement (or even in the best possible one) it would be impossible to predict exactly what would happen. We can only predict the odds! This would mean, if it were true, that physics has given up on the problem of trying to predict exactly what will happen in a definite circumstance. Yes! physics has given up. We do not know how to predict what would happen in a given circumstance, and we believe now that it is impossible—that the only thing that can be predicted is the probability of different events. It must be recognized that this is a retrenchment in our earlier ideal of understanding nature. It may be a backward step but no one has found a way to avoid it. No one has figured a way out of this puzzle. So at the present time we must limit ourselves to computing probabilities. We say “at the present time,” but we suspect very strongly that it is something that will be with us forever—that it is impossible to beat that puzzle—that this is the way nature really is. So why is it that at the scale of the tiniest parts of the universe, that there is all this randomness? Why has science given up on precise predictability, and accepted that uncertainty and chance rule the microscopic domain of the most basic and fundamental building blocks of the universe? Why can only probabilities be known? With the advent of quantum mechanics, we have come to recognize that events cannot be predicted with complete accuracy but that there is always a degree of uncertainty. If one likes, one could ascribe this randomness to the intervention of God, but it would be a very strange kind of intervention: there is no evidence that it is directed toward any purpose. Indeed, if it were, it would by definition not be random. In modern times, we have effectively removed the third possibility above by redefining the goal of science: our aim is to formulate a set of laws that enables us to predict events only up to the limit set by the uncertainty principle. There is always an element of uncertainty or chance, and this affects the behavior of matter on a small scale in a fundamental way. Einstein was almost singlehandedly responsible for general relativity, and he played an important part in the development of quantum mechanics. His feelings about the matter are summed up in the phrase “God does not play dice.” But all the evidence indicates that God is an inveterate gambler and that He throws the dice on every possible occasion. Regarding quantum physics, Einstein said that “God does not play dice”, and Stephen Hawking says, “God throws the dice on every possible occasion”. But what does the Bible say on the topic of dice and God? Prov 16:33 We may throw the dice, but the LORD determines how they fall. Assuming that whether it is us or the universe that throws the dice, it makes no difference, then what the Bible indicates is that God set up the universe to “play dice” on a quantum level, but at the same time, God is the one that determines how those “quantum dice” fall. By “quantum dice” I am referring to all of the subatomic particles/energies and their activities on the microscopic scale of the quantum level. However, if the uncertainty principle of quantum physics is correct, then the Bible assures us that God still sets the rules and outcomes for the seeming “randomness” of the “quantum dice”. God is in control of the randomness and the probabilities that we see. John Byl has a PhD in Astronomy, is the author of the book “God and Cosmos: A Christian View of Time, Space, and the Universe”, and is Professor of Mathematics and Head of the Department of Mathematical Sciences at Trinity Western University. (2) He restricts His action to produce a world that, for all we can tell, is orderly and law-like. William Pollard PhD, is a Nuclear Physicist and Episcopal Priest, with a PhD in Physics and Honorary doctorates in science, divinity, law, and humane letters. He is the author of “Chance and Providence: God’s Action in a World Governed by Scientific Law”. The entire book is on God operating, instead of “chance”, in quantum mechanics. Nancey Murphy PhD, Theologian, is Professor of Christian Philosophy at the Fuller Theological Seminary. She also serves as an editorial advisor for Theology and Science, Theology Today, and Christianity Today. She is the author of “Divine Action In The Natural Order”. The word here for “consist” is “synistemi” (4921) and it means, “to consist of or be composed of, to cohere, put together, hold together or band together”. According to subatomic physics, it is the quantum force particles of bosons, and gluons that hold together atoms, and particles like photons and electrons that hold together different atoms. As such, this verse in the Bible could be referring to, that it is by God’s control over the “quantum dice” that makes these particles we are composed of to hold together. As such, by His actions all things hold together or “by Him all things consist”. Assuming it is true that God does allow randomness at a quantum level of physics, but also constantly controls the outcome of that randomness, besides “upholding all things”, like the universe, “by the word of His power” (Heb 1:3), is there another possible reason for God creating the universe to be this way? Could it relate to miracles, signs and wonders? This could very well be the case. Not only does quantum physics allow for existing particles that we can observe in experiment to act in random ways, but it also allows for particles and antiparticles (antimatter) to pop in and out of existence, seemingly randomly. These particles usually only exist for a very short time, and are called “virtual particles”. Virtual particles have been shown, through experiments, to exist, as seen in the Lamb shift and the Casimir Effect. “As we saw in Chapter 7, even what we think of as “empty” space is filled with pairs of virtual particles and antiparticles that appear together, move apart, and come back together and annihilate each other. Now, suppose one has two metal plates a short distance apart. The plates will act like mirrors for the virtual photons or particles of light. In fact they will form a cavity between them, a bit like an organ pipe that will resonate only at certain notes. This means that virtual photons can occur in the space between the plates only if their wavelengths (the distance between the crest of one wave and the next) fit a whole number of times into the gap between the plates. If the width of a cavity is a whole number of wavelengths plus a fraction of a wavelength, then after some reflections backward and forward between the plates, the crests of one wave with coincide with the troughs of another and the waves will cancel out. Virtual particles can include all types of particles, including photons, electrons, gluons, bosons, and quarks. According to physicists, under certain conditions in the universe, virtual particles can exist for longer periods of time and therefore become “real” particles. This particular example relates to conditions of space near a black hole, but in principle this shows that science does generally allow for the possibility of virtual particles popping into existence and becoming real particles. “We can understand this in the following way: what we think of as “empty” space cannot be completely empty because that would mean that all the fields, such as the gravitational and electromagnetic fields, would have to be exactly zero. However, the value of a field and its rate of change with time are like the position and velocity of a particle: the uncertainty principle implies that the more accurately one knows one of these quantities, the less accurately one can know the other. So in empty space the field cannot be fixed at exactly zero, because then it would have both a precise value (zero) and a precise rate of change (also zero). There must be a certain minimum amount of uncertainty, or quantum fluctuations, in the value of the field. One can think of these fluctuations as pairs of particle of light or gravity that appear together at some time, move apart, and then come together again and annihilate each other. These particles are virtual particles like carry the gravitational force of the sun: unlike real particles, they cannot be observed directly with a particle detector. However, their indirect effects, such as small changes in the electron orbits in atoms, can be measured and agree with the theoretical predictions to a remarkable degree of accuracy. The uncertainty principle also predicts that there will be similar virtual pairs of matter particles, such as electrons or quarks. In this case, however, one member of the pair will be a particle, and the other an antiparticle (the antiparticles of light and gravity are the same as the particles). According to science it is possible that physical quantum particles can randomly pop into existence seemingly out of nowhere. If God is controlling the “quantum dice”, then this means God could cause these subatomic quantum particles to come into existence out of nowhere. This does not contradict the laws of physics in any way. Rather the laws of physics and modern science make clear that subatomic quantum particles popping into existence from out of nowhere is the normal state of the universe, which science has confirmed. And it is entirely possible for this randomness to be controlled by God controlling the “quantum dice”; and the quantum randomness seen has no explanation. Metaphorically speaking, this is a huge hole in the wall of science, which allows for the hand of God to come through into the physical universe, without in any way contradicting science or the known laws of physics. This shows that science actually allows for miracles and the miraculous done by God, without it in any way conflicting with Science or Modern Physics. Modern Physics teaches that elementary particles, of all kinds, can and do randomly pop in and out of existence. This includes photons, which are particles of light. This also includes gravitons, which are theoretical and theoretically instrumental in gravity, as well as gluons, bosons and other force carrying particles. 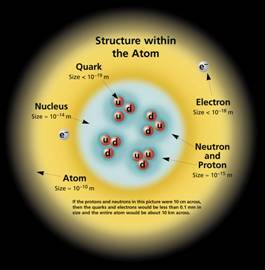 Some force carrying particles are what hold quarks together to form neutrons and protons, and other force particles hold together atoms. All of these particles can pop into existence out of nowhere, seemingly randomly, the universe allows for this, and the universe was created by God intentionally to be the way it is. 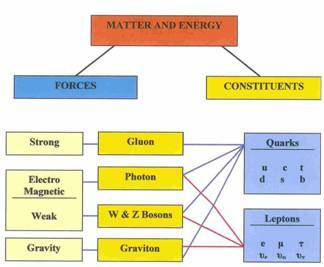 What are quarks and electrons? They are the particles that are the building blocks of atoms. 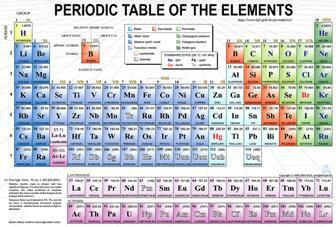 Different types of atoms make up all of the elements of matter, as seen in the periodic table of the elements. 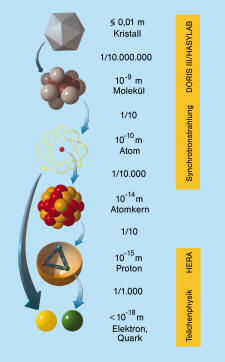 Atoms are the building blocks of all the matter we see, and our bodies are made of atoms. So assuming God, who is omnipotent, one way or another controlled the randomness of the quantum world… then this means that God could choose to have a large number of quarks, gluons, electrons, etc. pop into existence very quickly, and assemble into atoms. God could also do this in such a way that many atoms were formed, and would assemble into much larger objects, even objects large enough that we could see them. And the word of the LORD came unto him, saying, Arise, get thee to Zarephath, which belongeth to Zidon, and dwell there: behold, I have commanded a widow woman there to sustain thee. So he arose and went to Zarephath. And when he came to the gate of the city, behold, the widow woman was there gathering of sticks: and he called to her, and said, Fetch me, I pray thee, a little water in a vessel, that I may drink. And as she was going to fetch it, he called to her, and said, Bring me, I pray thee, a morsel of bread in thine hand. And she said, As the LORD thy God liveth, I have not a cake, but an handful of meal in a barrel, and a little oil in a cruse: and, behold, I am gathering two sticks, that I may go in and dress it for me and my son, that we may eat it, and die. And Elijah said unto her, Fear not; go and do as thou hast said: but make me thereof a little cake first, and bring it unto me, and after make for thee and for thy son. For thus saith the LORD God of Israel, The barrel of meal shall not waste, neither shall the cruse of oil fail, until the day that the LORD sendeth rain upon the earth. And she went and did according to the saying of Elijah: and she, and he, and her house, did eat many days. And the barrel of meal wasted not, neither did the cruse of oil fail, according to the word of the LORD, which he spake by Elijah. God provided for 3 years oil and grain, though the land was in a drought with famine. This oil and grain appeared seemingly out of thin air. But another way to put it might be that it appeared out of “seemingly random quantum foam”. And there are many miracles, signs, and wonders in the Bible, done by God, which are similar to this, such as Jesus Christ feeding the multitudes of thousands from a couple fish and a few loaves of bread. Also, there are miraculous healings mentioned many times in the Bible. 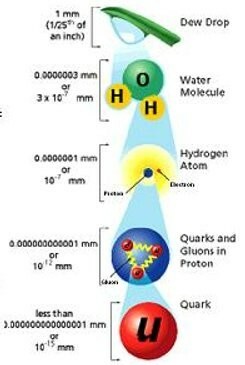 According to science, our bodies are made up of molecules of atoms, which are made from quarks and electrons and such. Consider the cases of sight being restored to the blind, the healing of the disfigured hand, the healing of lepers, and the healing of all manner of sicknesses; miracles done by Jesus Christ. Control over the “quantum dice” would be one way to explain how sick flesh was instantaneously changed into healthy flesh. And so this is one way to describe, in modern physics concepts, how God does miracles, signs, and wonders. Though God does do them, whether control of the “quantum dice” of quantum physics is truly and specifically how, or not. But the Bible also says that Holy angels, and Fallen angels, also work miracles, signs and wonders. (Acts 2:22, 5:12, 2 Peter 2:11, Heb 2:4, Matt 24:24, 2 Thes 2:9, Rev 13:2, 14, 16:14) So it could be an accurate description to say that how fallen angels also do miracles, signs, and wonders is because they too somehow have control over the “quantum dice”, though definitely on a more limited scale than God does. The Bible teaches that God is everywhere in the universe, and there is nowhere that He is not. Whereas fallen angels have a set, limited, location for their spirit body, and are only in one place at a time, much like mankind. Under this line of reasoning, God has power, and “quantum power” over everywhere in the universe, but fallen angels only have power or “quantum power” in their immediate location. Also, God has power over the fallen angels’ spirit bodies themselves, as their bodies are part of the creation, whereas fallen angels have no such power over God. It may be that the extra-dimensionality of angels is what would make possible them having limited control over the “quantum dice” in their immediate location. -Michio Kaku PhD, “Into the Eleventh Dimension”, author of Hyperspace: A Scientific Odyssey through the 10th Dimension, Oxford University Press. According to String Theory, particles in the 4-dimenional space-time we observe, are the result of vibrations of 1 dimensional strings that exist in an additional 6-7 dimensions, in the scientific sense of the word which (comes to10-11 dimensions total). As such, speaking generally according to science in principle, it is possible that the extra-dimensionality of angels would allow for their altering of particles in our 4 dimensional world, on the subatomic quantum level. As such, their extra-dimensionality, in the spiritual realm, may be tied directly to their ability to work “miracles, signs, and wonders”, possibly through being able to determine how the “quantum dice” fall (on a limited scale in their immediate locality). To illustrate, imagine that sitting on a table, is a cup. This cup has 3 spatial dimensions, and as the second pass, it moves through the 4th dimension of time. Now, in the exact same location as the cup, would be 6-7 invisible dimensions that you can’t see. And that is because these invisible 6-7 dimensions intersect the 4 dimensions we know at every point. These 6-7 dimensions are most definitely not somewhere else, but are in the same place we are, but invisible. Now, if these 6-7 extra dimensions correspond to the invisible spiritual realm that the Bible teaches, then an angel who has a spirit body would have an invisible spirit body comprised of the stuff of these 6-7 extra dimensions. And such an invisible angel could choose to effect the 6-7 extra dimensions where the cup is located so as to knock the cup over. In other words, fallen angels have spirit bodies in the invisible spiritual realm. If the spiritual realm is composed of these extra 6-7 dimensions, then the spirit bodies of the fallen angels are composed of the spiritual realm, these extra 6-7 dimensions. Just as the invisible spiritual realm is all around us, so also could be these 6-7 extra dimensions. According to String Theory (just a theory) what we observe as an effect in our 3 spatial dimensions is caused by what happens in the 6-7 invisible extra dimensions. This means that an extra-dimensional angel could use their extra-dimensional spirit body in the 6-7 extra dimensions, to have the effect of changing things in the physical 3 dimensions we perceive. And in this, fallen angels would also have limited control over how the “quantum dice” fall, but only in a very limited location where they are present. As the invisible realm is all around us (or these extra dimensions would be also) a fallen angel can only effect changes in the immediate locality around them, in the location of their spirit body. And so this shows how Modern Physics also allows for angels or fallen angels to work miracles (in a limited locality) along the same lines as how Modern Physics allows for God to work miracles. And so angels can also work miracles and do the miraculous, without violating and laws of Modern Physics or science. Rather, Modern Physics and Science totally allows for the existence of angels, their spirit bodies, the invisible spiritual realm, and the miraculous powers of angels as described in the Bible. When it comes to Holy angels or fallen angels, the Bible describes that they can cause dreams and Visions, as well as causing the physically miraculous or miracles. In the case of fallen angels, they cause False Visions, which can seem entirely physically real to a victim, and also dreams. Beyond this fallen angels can cause physical injury, and other sorts of physical manifestations, like objects moving, or recording film being altered, etc. These physical manifestations would be considered as false signs, false miracles, and false wonders, Biblically speaking. I think that fallen angels being able to control (in their immediate locality) how the “quantum dice” fall, would work as a way to explain Physical manfestations very easily, both with visible angels materializing, or seeing the physical effects of invisible angels, including the physical aspects of Visions. Excepting time perception manipulation, I also think this “quantum dice” idea explains all varieties and aspects of Visions quite well, and also dreams. This is because the human brain also can experience the effects of a fallen angel being able to control the “quantum dice” (in a limited localized way). Although the effect of quantum mechanical uncertainty in the brain is normally small, if fallen angels can determine how the “quantum dice” fall, then a fallen angel could make the effect quite large and noticeable. Regarding False Visions, all of our physical senses are dependant on how our brain interprets them. By fallen angels generating electrical impulses in the brain, and such things like that, fallen angels would be able to make us “see” things that are not actually in front of our eyes, and “hear” things that are not there to make any sound, “feel” things that are not touching our bodies, “smell” things not before our noses, and “taste” things that are not on our tongues. These things would seem completely real to all of the bodily senses. And the electrical impulses that are truly transmitting information about reality around us could also be blocked out by fallen angels, under this same ability. Or actual reality could be partially blocked. And either way, false electrical signals in the brain generated by fallen angels, through manipulation of the “quantum dice”, could cause a person to experience a False Vision that seemed entirely physically real, but was not. A person could be caused to perceive something completely illusionary, by a fallen angel manipulating that person’s brain, which is a person’s gateway to physical perception. As such, an illusion could seem completely physically real to all of the bodily senses, so much so as to be completely indistinguishable from reality to the person. This manipulation of the senses through manipulation of the brain is very likely what happens in False Vision (or in Holy angelic true Visions). Fallen angels could cause this to happen to more than one person at a time, strengthening the deception. And also under the same limited control over the “quantum dice”, fallen angels could cause physical manifestations, even running concurrently with a Vision which seems real. This sort of deception can be very powerful. Dreams could be explained much in the same way, but the same sort of thing occurring while the person is asleep and dreaming. Besides all of this, there is one more thing which is miraculous that fallen angels do, which modern science allows for in a specific way. That is time perception manipulation.